Historic Downtown Cortland transforms itself into a fairytale setting for this year’s “Once Upon a Time” Halloween parade. 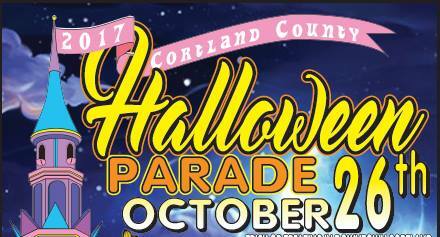 All Cortland County children under 18 years of age and families are invited to participate in the parade and trick or treating hour which precedes the parade at 5:00pm. This year’s theme celebrates the Cortland Free Library. The parade is made possible through collaboration between the Cortland Downtown Partnership’s Promotions Committee, Cortland Repertory Theatre Downtown, the SUNY Cortland Bike Program, Cortland Kiwanis Club, and Cortland Elks Lodge #748. Cortland Elks Lodge #748 will host a spaghetti dinner 5:00pm – 8:00pm on October 13. Proceeds will be used to purchase prizes for the parade’s costume contest. Tickets are available now for the dinner through the Cortland Elks Lodge #748 Facebook page and at the door. Cheerful and Creative, located at 31 Main Street, will host a decoration building workshop Saturday, October 14 at 10:00am and with the help of volunteers, will install decorations made at the workshop along the parade route. Parade lineup begins at 6:00pm at the beginning of one-way Main Street, with parade start at 6:15pm, landing at the Cortland Repertory Theatre for costume contest awards. Those wishing to participate in the costume contest are encouraged to pre-register online and check-in at the Cortland Elks Lodge before 6:00pm in time for the start of the parade to receive their numbered contest paddles. Cortland Repertory Theatre Downtown receives parading children in the costume contest where emcee and theatre program director Kris Behnke will announce costume winners. The public is also invited to vote this year to award a People’s Choice winner by posting the paddle number of their favorite contestant on the Cortland Halloween Facebook page by Friday, October 27 at 3:00pm. The parade will be escorted by “glow riders”- bicyclists involved with the SUNY Cortland Bike Project. The group will light the way with glowing bikes and special bike floats that competed in a contest for best bike earlier in the day on campus. Costume Contest registration forms are now available online with links on the event’s Facebook page: Cortland Halloween Parade, and at the Cortland Free Library. Day-of registration and check-in for the event will take place between 5:00pm – 6:00pm at the Elks. Call 607.299.4682 or email info@cortlanddowntown.com with questions, donations, volunteer opportunities, and for parade registration forms. Visit Cortland Halloween Parade on Facebook for updates. Registration and check-in for the contest judging at Cortland Elks Lodge, 9 Groton Avenue. Parade lines up at top of one-way Main Street. Parade starts and travels down Main Street, turns left onto Court Street, pauses for judging at the Showmobile at the corner, then proceeds down Court, turning right at the municipal lot at the Cortland Fire Station to the Cortland Repertory Theatre. Five awards given in each Division Infant – Grade 2 and Grade 3-6 for Best in Theme, Most Original, Cutest/Scariest. Two awards in each category for Division Grade 7-12. An award for Best Group, and another for Best Family. Children under 9 require adult supervision in the parade. If you accompany younger children, please step back for judging at the Showmobile at the corner of Court Street. Parade will commence as planned with no rain date unless there are extreme, hazardous weather conditions, in which case notification of cancellation will be made by 2:00pm October 29 on 101.5 WXHC and Cortland Downtown Partnership’s Facebook page. Human-powered wagons, bicycles, carts allowed (no motorized vehicles); no animals. Please plan to park on the outskirts of the one-way Main Street area as it will be closed for the parade around 3:30pm.